Hydroponics has the stigma of being solely used to grow marijuana. Every time someone asks me what I do/what industry I'm involved in their initial reaction is to say, "you mean weed?!?" I'll then give them a chuckle and explain how it can also be used to grow vegetables and other produce. Even though hydroponics has been around for quite some time, it still surprises me how foreign of a concept it is to the general public. In an effort to help those who may not know much about the subject and to refresh those that already might, let us delve into the world of water farming! 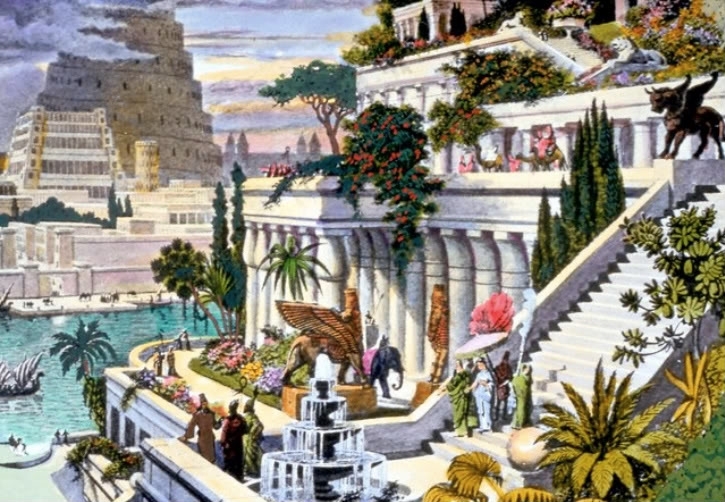 Hydroponics might have first been introduced in the Hanging Gardens of Babylon circa 8th century B.C. "Guys, did you hear? Bob still uses dirt. Ha! Loser." We aren't 100% sure of this since there is no evidence that the Hanging Gardens ever existed. If they DID however, it might have been likely they used a form of nutrient film technique (N.F.T.) to water their plants (I will cover this topic in a future blog). Now, the first written evidence dates back to 1627 in a book written by Sir Francis Bacon entitled Sylva Sylvarum. I've tried to read excerpts from it, but Ye Olde English is darn hard to read and understand. Fast forward a few hundred years, where in 1929 a man by the name of William Frederick Gericke of UC Berkeley started to advocate "solution culture" for use in agricultural farming. He grew tomato vines in his backyard with his method that towered up to 25ft. tall! The term "hydroponics" wasn't coined by him until 1937. 1) There is no gravity in space, thus you cannot just place soil in a pot and put water into it. The soil would get everywhere! 2) Shipping food with astronauts is heavy and thus cost prohibitive. Being able to shed as much weight as possible for a launch is critical. If they are able to grow their own food instead of taking it with them, it would mean lighter/cheaper flights into space. *3) Quality of Life (not mandatory, but would be nice). Ahhh, nothing like crisp, fresh lettuce in space. For astronauts, who only eat freeze dried or vacuum packed food, this would be wonderful. None of that stuff is fresh and probably tastes bland as hell. Fresh produce could boost moral from mundane eating AND convert the carbon dioxide back to usable oxygen! Win-Win! But don't you NEED soil to grow plants? NO, as long as you can provide the plant with a solution of proper nutrients, it can grow just as well, if not better. This is one of the main misconceptions people have about plants. Soil farming is obviously the most common and most used practice still in existence, but that has led the general public to believe that it is the ONLY way. In a hydroponic system you are directly feeding the plants in a more efficient and eco-friendly way. In the next post I'll discuss the key benefits of hydroponics vs. soil farming. Hydroponics is getting popular almost in all parts of the world. In India hydroponics can be considered as a necessary step which has to be taken in the field of agriculture. The climatic conditions of India are changing from day to day and people can see a vast difference in the climate for the past few years. Hydroponics in Gurgaon is getting more developed as the organizations prevail there are taking more steps forward to make hydroponics popular among the people as well as the students who are the future of our nation. Hydroponics plants in India grow faster and healthier than other forms of agriculture as minerals and nutrients are given directly to the roots of the plants at all time. This mineral water is changed according to the schedules and in NFT method of hydroponics.